Travelers wait on the platform in Hartford on Monday morning to board a Hartford Line train bound for New Haven. Bronx resident Thomas Rome would regularly crisscross between New York City and Hartford by car for nearly three hours to practice as a lawyer at his two offices. On Monday, Rome said his life completely changed when he joined other weekday commuters in riding CTRail’s newly launched Hartford Line. Bronx resident Thomas Rome said the new Hartford Line has changed his life as a commuter. Rome was one of about 30 commuters who rode the new train line among mostly empty seats during Monday morning rush hour from New Haven to Hartford. The light passenger traffic contrasted with the Hartford Line’s opening weekend in which a total of 21,850 people flooded platforms to board to the new rail service. Officials say 10,300 people boarded the Hartford Line during its opening day on Saturday. They added further service to the line on Sunday, when ridership attracted 11,550 passengers, to keep up with the high demand during the weekend of free rides. The new line links New Haven with Springfield, Mass. —with stops in Wallingford, Meriden, Berlin, Hartford, Windsor, and Windsor Locks in between. Gov. 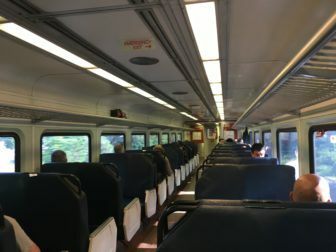 Dannel P. Malloy rode the new train line from New Haven to Hartford on Friday morning before participating in an opening ceremony with officials from Connecticut and Massachusetts. Malloy said the project would stimulate economic growth, ease congestion and improve residents quality of life. Commuters sit on the Hartford Line train from New Haven to Hartford on Monday morning. 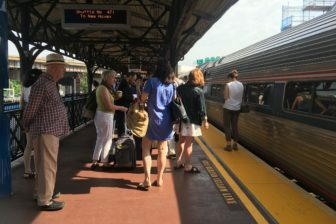 The scattering of quiet Monday morning commuters were riding the train line during its run from New Haven Union Station at 8:15 a.m. to Hartford, arriving at 9:09 a.m. The only earlier train serving rush hour departs at 6:35 a.m., and arrives in Connecticut’s capital city at 7:29 a.m.
Connecticut Department of Transportation Commissioner James Redecker said the new train service has created a spine of high-speed train service in a corridor that has never had such rail transportation. “This is a major new core of a regional network, and represents to some degree, a major milestone in achieving a vision for Connecticut’s public transit system,” Redecker said. But Redecker said he doesn’t have overnight expectations for usage, and believes the roughly $768 million project will take three to five years to reach market maturity. Redecker noted there are early adopters who already bought their July monthly pass in advance or are living in mixed-use development complexes along stations in the corridor. The DOT commissioner said the combination of 17 daily added trains, and the affordable price points will drive passenger use and become a transportation option for residents traveling for business, school, and tourism on a regular basis. 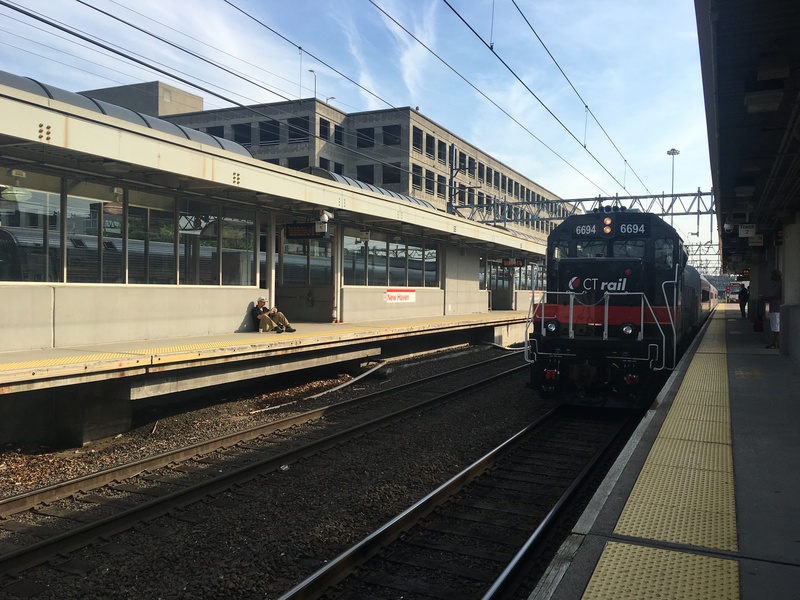 Joseph McGee, the vice president of public policy and programs at The Business Council of Fairfield County, said the Hartford Line will serve as a tremendous opportunity for Connecticut to grow economically. McGee said rail service is a new economic backbone for the state — creating more job opportunities, drawing businesses, and helping real estate develop around train stations. University of Connecticut student Chris Oldham waited for the early train on the New Haven platform with black over-ear headphones and an energy drink in hand. The 21-year-old was returning to the Storrs campus using the system’s free U-Pass after visiting his parents for Father’s Day in Stamford. The Hartford Line arrives at New Haven Union Station during morning rush hour Monday. The state is operating eight of the trains, while Amtrak is running the remaining ones for the same price. A trip from New Haven to Hartford costs $8 and 80-minute rides to Springfield are $12.75. Passengers can travel for $6 from Hartford to Springfield. 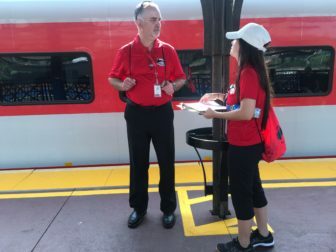 At the Hartford station, CTRail service ambassadors clad in bright red t-shirts stood on the platform at 9 a.m. to answer questions and hand out schedules. CTRail service ambassadors Philip Scarrozzo and Deborah Silva stand on the platform in Hartford. Philip Scarrozzo, who worked at New Haven’s Union Station on Sunday from 3 p.m. to 10 at night, said the Hartford Line received a lot of positive feedback over the weekend as massive crowds flocked to try the service. Scarrozzo said because it’s a new service, it will take time to attract regular commuters. 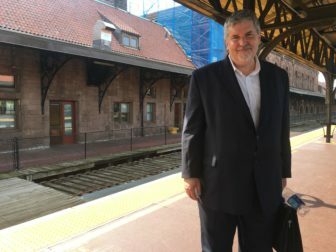 Jonathan Judd, a 50-year-old Wallingford resident aboard the Hartford Line, said he will switch from driving to commuting by train to his job at health insurer Aetna in Hartford. But the rail service would attract more commuters if it added additional trains during rush hour to give passengers further options, Judd said. “It will be the same in terms of time-wise, but I have to pay for parking up in Aetna so eliminating that, eliminating gas, factoring in the monthly commuting — it’s going to be a little bit better for me cost-wise,” Judd said. Rich Sinks of Wilton echoed concerns about the train line’s limited rush hour time slots and said he wished there was one that arrived in Hartford around 8:15 a.m. Sinks, who works in Prudential Financial’s retirement division, said he was surprised the Hartford Line wasn’t crowded. Wilton resident Rich Sinks rides the Hartford Line for the first time while commuting to work. The train’s mostly smooth opening was marked by a few problems, including that half of the train’s bathrooms, those on CTRail, aren’t accessible to the disabled. Redecker said the rail cars bought for the train line were built before the American with Disabilities Act, but will be retrofitted to accommodate those with wheelchairs. The Federal Railroad Administration directed the state’s DOT to temporarily close the bathrooms until they are accessible to all passengers. Delores Jackson, a 48-year-old disabled Hartford resident aboard the train, said she is glad they are making the bathrooms accessible for the disabled. Jackson said the train line’s cheaper rate will allow her to visit family in Bridgeport more frequently. Jim Cameron, the founder of the Commuter Action Group, which represents Metro-North commuters, said education about the rail service and marketing by DOT will be key in attracting weekday commuter ridership. “The schedule will be good, trains will be fast and dependable, but the motorists are still going to have to be lured into trying the service,” Cameron said. A legislative committee took the first steps Wednesday on what would be a long and complex journey to implement a comprehensive system of electronic highway tolls in Connecticut.